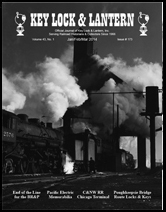 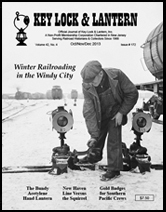 Winter Railroading in Chicago, the Bundy acetylene lantern, Southern Pacific award badges, New Haven Line vs the Squirrel, early lock diagrams, Q&A Column, Members Display Cabinet, Photos from Along the Line. 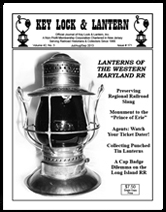 Western Maryland Lanterns, Regional Railroad Slang, Punched Tin Lanterns, Ticket Daters, Long Island RR Badges, Monument to the Prince of Erie: James Fisk, Photos from Along the Line. 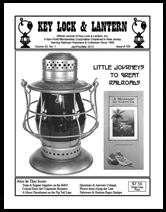 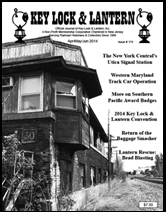 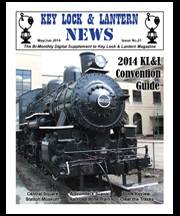 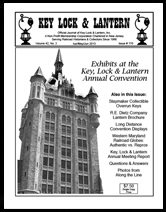 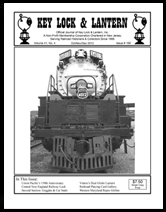 Railroadiana Exhibits at the KL&L Convention, Long Distance Displays, Slaymaker Overrun Switch Keys, Dietz Lantern Brochure, Western Maryland Lantern Globes, Q&A Column, Photos from Along the Line. 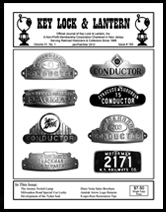 Roycroft Railroad Advertising, Conrail Commuter Trains, A Derailment on the Pig Tail Line, Reproduction Delaware & Hudson Badges, Train & Engine Supplies on the Baltimore & Ohio, Q&A Column, Photos from Along the Line. 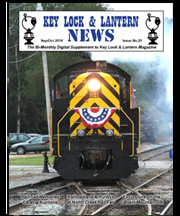 An Unusual Central New England Ry Lock, Frederick Vinton's Dual Globe Lantern, Union Pacific Railroad Celebrates 150 Years, Western Maryland Reproduction Globes, Tyden Seal Flyer, Q&A Column, Photos from Along the Line. 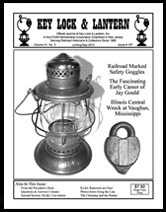 The Early Career of Jay Gould, Railroad Marked Safety Goggles, Illinois Central Wreck at Vaughan, The Story of the Chemung & the Peanut Line, More KL&L Convention Displays, Q&A Column, Photos from Along the Line. 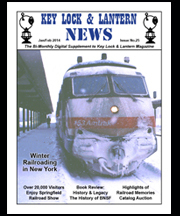 Railroadiana Displayed at the Key Lock & Lantern Convention: Erie RR, Lake Shore & Michigan Southern, etc., The Empire State Xpress RoadRailer, Kansas City, Mexico & Orient Railway, Paper Railroadiana Restoration, New Q&A Questions & More. 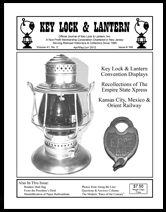 The Development of the Tyden Car Seal, Atomic Switch Lamps, Milwaukee Road Locks & Keys, The Amtrak Arrow Logo Returns, Evapo-Rust Lantern Restoration Tips, Q&A Answers: Cast Iron CP Cover Plate, Key Lock & Lantern Annual Meeting Announcement, Dietz Vesta Lantern Advertising Brochure.